The Pembrey round of the HSA championship was organised by The British Automobile Racing Cub Wales and was two meetings back to back – Saturday and Sunday 4th and 5th June. On the Saturday I was the only MX5 and I missed my old mates from the HSA MX5 class. Not only wasn’t there the usual banter, there was no one I could really benchmark myself against and as this was the first time the HSA championship has visited Pembrey there wasn’t even a class record for comparison purposes. Pembrey is a wide, fast 1.45 mile circuit in south west Wales and for this sprint event the timed distance was one and three quarter laps. As I’ve undoubtedly mentioned before in this blog, I seem to be very slow at learning tracks, especially circuits where the width of the road increases your options at every turn. Narrow twisty hillclimbs in comparison are far easier, though the consequences of making a mistake normally far worse as they don’t have the run off areas that circuits do. The schedule of the day was, as usual, two timed practice runs in the morning and then two timed competition runs after lunch. So without the distraction of the rest of the MX5 guys, there seemed to be a lot of waiting around to be done. My first run was 153.84 and the second 156.84. After lunch I did a 153.02 followed by a 150.45 and I knew my driving was terrible. Nothing was flowing, I didn’t know where the turn in points were (actually I didn’t know where the turns were, let alone the turn in points), I was braking in all the wrong places and lifting in the middle of corners. Having spent a glorious hot and sunny summer’s day hanging about in a paddock and to finish up realising you drove terribly is quite depressing and you wonder why on earth you’re doing it. I had a word with Fyrth Crosse who is always very encouraging and he was kind enough to give me some pointers for the following day – basically, to carry more speed through corners – a lot more through the long, sweeping Paddock bend – to use more of the road and the curbs and to use a higher gear and not brake at the Esses. So that became my plan for the Sunday. Because Pembrey is a new venue for the HSA championship my abysmal best time became the new HSA MX5 class record and I’ll collect a bundle of points for setting it, which I’m extremely embarrassed about. I felt I earned my points at Werrington and Wiscombe but not here. Sorry guys! On Sunday I was joined by Mervyn Brake in another 1600cc MX5 – a very standard looking Mk 2. Mervyn is the championship secretary at Woolbridge Motor Club (who organised Wiscombe Hill Climb a few weeks back) and he used to race a Maguire Imp back in the eighties. My first practice run was 150.51 but I was encouraged by a second run of 147.31. This is always the case with my driving, it improves by small increments and I leave the track feeling that if only I could do twenty laps I’d master it, but of course in hillclimbs and sprints you don’t have that option and Fyrth’s attitude is that that in itself is part of the challenge. After lunch I put in a 144.69 and sensed that I was beginning to get it right. I was much smoother from Dibeni Bend through Paddock but couldn’t forego the brakes for the Esses. I’m sure if I had had a few more laps I’d have done it. Then on my second timed competition run I locked up going into the hairpin and lost time as the video shows and recorded a 145.56. Looking at the video I can see all the places where I should have kept the power down, shouldn’t have braked etc. It all looks so easy to correct. Well, I’ll have to wait until next year to try to fix it all. 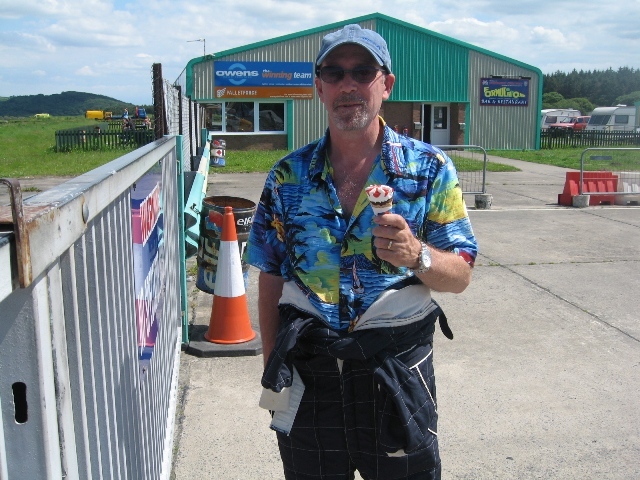 Next week – Curborough where Paul Webster’s HSA class record is 39.50 and my best time is 40.17 but the big question will be whether Nick Mugglestone has entered as he recorded a 38.23 at a non-HSA event earlier in the year. I hope he has. It takes a confident man to rock that particular shirt, eh bob!!!! a class record is a class record, if someone else wanted it, they should have blooming well turned up then, shouldn’t they!!! Did you get rid of that oil cooler? Mega upset we couldn’t get to Pembrey to give you some stick Bob, I love the place having done quite a few test days there with my “proper job”. My best lap is down in the low 48s but that was set with 550bhp and hot slicks, so the little Mazda would have been a whole new ball game! Not going to be at Curborough either as we have the little matter of the LeMans 24 hours to keep us busy! Been up town at Scrutineering today, running starts Wednesday night. Yes shame you weren’t there – I needed some coaching! And it was pretty boring being there by myself. Anyway, good luck at LM.